We’d love your help. Let us know what’s wrong with this preview of Build It by Glenn Elliott. To ask other readers questions about Build It, please sign up. Why did you decide to write a playbook instead of just a book? When deciding to be rebellious and do something a bit different, did you ever encounter any hard/entertaining resistance to your ideas? Won a signed copy in Goodreads Giveaways. This is a very clear guide to boosting engagement in your company. It spells out how engagement is not the same as staff happiness, why companies have such a gap between the level of engagement they have, and the level they would want to have, and all the benefits that flow from an engaged work force. It's based on a well-structured model (the engagement bridge) which brings together all the factors required to boost engagement. Coupled with tons of practical, real-life examples from companies of This is a very clear guide to boosting engagement in your company. It spells out how engagement is not the same as staff happiness, why companies have such a gap between the level of engagement they have, and the level they would want to have, and all the benefits that flow from an engaged work force. It's based on a well-structured model (the engagement bridge) which brings together all the factors required to boost engagement. Coupled with tons of practical, real-life examples from companies of all shapes and sizes, this will give you plenty of food for thought, and some great ideas on how to implement change. If, like me, you're already a rebel and a rule breaker, you'll love this book. If you want to bring out a bit more of your rebellious side, you'll love this book. If you're not yet a rebel but want to improve engagement in your business, you'll love this book. Basically, if your role involves working with, managing or leading people then you'll love this book. It's packed with case studies (plays), hints, tips, common sense (if only there was more of this in the world right!! ), and a passion for doi If, like me, you're already a rebel and a rule breaker, you'll love this book. It's packed with case studies (plays), hints, tips, common sense (if only there was more of this in the world right!! ), and a passion for doing things differently. If you want to engage your people more, to lead your people more and to motivate your people more, you need to read this book. I'm already looking forward to the sequel. Great work and delighted to have been able to get my hands on it early. If you haven't ordered it, do. Excellent read for anyone with an interest in employee engagement and performance, particularly people managers and leadership. It's a great mix of theory and practical guidance, which is rare to find in this area. As a consultant I particularly like how the Engagement Bridge model is applicable to companies of varied size, industry and culture because absolutely everyone has something to learn from the rebels out there. I am often asked by clients what others are doing differently (or better) t Excellent read for anyone with an interest in employee engagement and performance, particularly people managers and leadership. It's a great mix of theory and practical guidance, which is rare to find in this area. As head of HR for the startup that I work at I've found this a really interesting book - with both overarching concepts and real life examples about how to keep employees happy. It's split into different chapters (e.g. Leadership, Pay and Benefits, Wellbeing) so it's super easy to either dip in and out if there's a specific situation at your work. Equally it's written in a friendly and readable style - so also interesting enough to read it cover to cover! I was lucky enough to receive a pre-order o As head of HR for the startup that I work at I've found this a really interesting book - with both overarching concepts and real life examples about how to keep employees happy. It’s 2018. Employee engagement, now, is a complete necessity in any organisation regardless of size or industry. If your employees aren’t engaged, then it’s only a matter of time before things start to crumble. This playbook is just wonderful for anyone who’s looking to stir things up and be a ‘rebel’ to inspire new levels of engagement - or for Managers and HR Professionals who just don’t know where to start - or for employees, who may not know what it is to be ‘engaged’, or are looking for insp It’s 2018. Employee engagement, now, is a complete necessity in any organisation regardless of size or industry. If your employees aren’t engaged, then it’s only a matter of time before things start to crumble. This playbook is just wonderful for anyone who’s looking to stir things up and be a ‘rebel’ to inspire new levels of engagement - or for Managers and HR Professionals who just don’t know where to start - or for employees, who may not know what it is to be ‘engaged’, or are looking for inspiration for their own workplace. Being in this industry, often reading HR targeted books and content isn’t the most enthralling (sorry, HR book authors and content writers). This book is conversational, it’s fun, it asks the right questions and it’s relatable. Employee engagement has been going through the classic 'HR fad cycle'. Initial development and successful financial impact of the idea in a limited number of customer service settings led to widespread hype and mass adoption of over-simplistic approaches, most notably through the eponymous annual survey. We all wanted to provide great, engaging places to work at the CEO's behest and outscore our competitors in those heady days of the early 2000s. Then post the financial Crash we have seen an acad Employee engagement has been going through the classic 'HR fad cycle'. Initial development and successful financial impact of the idea in a limited number of customer service settings led to widespread hype and mass adoption of over-simplistic approaches, most notably through the eponymous annual survey. We all wanted to provide great, engaging places to work at the CEO's behest and outscore our competitors in those heady days of the early 2000s. Then post the financial Crash we have seen an academic, management and employee reaction against the ill-defined concept and exaggerated claims made on its behalf: widespread disillusionment with the dashboards and league tables has set in. Nobody it seems wants to measure the declining levels of engagement in our cash and pay-constrained context. Some employers have found cash saving and cost cutting as an easier route to shareholder returns than engaging their employees, the so-called 'Sports Direct' employee exploitation model has been widely emulated. And ten years of anorexic approaches to pay awards and what one think-tank called ‘the worst decade on pay for two centuries’ has left employees financially worse off and suspicious and generally cynical about ‘engaging’ and ‘total rewards’ initiatives. Yet UK productivity growth remains marooned at the bottom of the OECD league table, with economists attributing a significant chunk of that shortfall against our overseas competitors to 'the human factor'. And the problem it appears from the latest IES research was not the surveys themselves, but the lack of practical actions by the majority of employers in response to their findings, to address the needs and motivations of their employees. Or as this book's authors put it, 'the problem with employee engagement is not what we're calling it' but the ‘lack of fundamental changes in (commonly employed) disengaging workplace practices'. No wonder strategy execution and employee engagement topped business leaders’ concerns in a recent survey carried out by London Business School’s Leadership Institute. This book is great on practical actions. It is packed with a myriad of ideas, initiatives and case examples covering every possible way to build an engaged and high performing workforce, with dozens more on the book's website. 'Ultimately' the authors tell us, 'engagement is a choice' and they provide plenty of examples from their experience and company visits for you to choose from, ranging from Estee Lauder to Homeserve, from HSBC to KFC Australia. So many that they could in fact become confusing. But they are organised and the book is structured around a clearly explained 10-factor model, the Engagement Bridge. It combines three 'underpinning elements' - pay and benefits, workspace and wellbeing - with seven more for ‘connecting your people to your organisation’, such as recognition, leadership, communications and purpose. Each chapter, after a nice ‘key points’ summary, takes you briefly through an element; and provides numerous short vignette examples of 'the plays', putting it into practice. 'The most important thing' they tell us 'is to get moving'. But how? What's most important to address and where do i start? The authors initially seem to favour a tailored ‘best fit’ rather than universal ‘best practice’ model of engagement: 'how important or urgent each element is depends on your organisation, your situation'. Academic research suggests they are right. But they provide precious little guidance on just how to tailor things to your situation and in their brevity, slide later in the book towards the universal generalisations as to ‘what works’ that they initially try to avoid and which has done much to besmirch the concept. Do i for example attempt to borrow Virgin or Colemans’ or Hersheys’ or ICC Sydney's approach to recognition? Or I develop my own? Though the authors tell me to never to ‘ration recognition with your reward budget’, how does that play in many restrained and cash-constrained public sector employers, where paradoxically, tight pay budget controls have forced them often quite effectively to consider the long-neglected area of recognition? But do i even start with recognition in some settings? As the authors say, ‘it depends’, but we get very little guidance on how to assess that. Do i build a workplace to 'drive agile working' like GE? Or one i could 'bring my mom too' like Pentland Brands? More tools and frameworks to diagnose and design tailored approaches would have been really useful. My biggest worry though is that in making these choices the authors seem to emphasise the radical, the rebellious actions, the most disruptive to the status quo and the existing culture. Try paying employees a month’s salary to leave like ‘wacky’ online retailer Zappos; borrow anarchic software company Atlassian’s three ‘innovation rituals’. ‘Rebelling is the only way to make a difference!’ they enthuse and set out a generic list of ‘key rebel behaviours’. Yet according to IES's research on successful change management, these are precisely the most risky and difficult initiatives to pull off. The most successful long-term sustained changes are mass movements, shifting the whole direction and culture in an organisation, but through an evolutionary rather than revolutionary approach. Playing the rebel may be cool, but it rarely appears in practice to succeed. And this, somewhat ironically, in the end is definitely not a book for rebels. If you have a CEO and board committed to investing in their staff to improve their engagement and willing and capable line mangers who can deliver then this book is perfect: get on and select and implement the examples that best suit your situation, practice what you preach, invest and watch your engagement and performance levels improve. But if you don’t have that luxury of sustained top-level commitment and widespread managerial capability then you will, frankly, struggle with the breathless enthusiasm and quick-fire style of this book alone. The business case they make for engagement is for believers, sketchy and heavily-based on belief and assertion. And for those not experienced in the area, the evidence to guide you on what works best in which setting is almost entirely lacking. Yet I regularly experience senior management teams who question whether employee engagement makes any difference to business performance, and why employers should get involved with some of the key drivers of it, such as employee wellness and financial wellbeing. The battle to invest in staff as the route to high performance is far from being won. So don’t take this particular short-cut-book to high engagement alone. It is a great, action-focused, high-speed trip through employee engagement. But as the authors admit, in reality the route is a ‘never-ending journey’. Use the IES publications and website for your evidence and business case; and the Engage for Success and CIPD websites for your analytical frameworks, tools and methodologies. But after a tough week of battling narrow-minded leaders and miserly cost-obsessed finance executives, of cajoling cynical staff and dealing with truculent trade unions, then this book should give you the espresso-shot of enthusiasm and the gems of examples you need to keep you going on your quest towards improving organisational performance and employee engagement. It is a truly noble endeavour and this book will help you with it. And you will enjoy it, I promise. The Rebel Playbook in one word. ‘Controversial’. And that is why I think it does what it sets out to do, and is such an important book for people wanting to make a change. Glenn and Debra challenge what so many of us think 'good looks like' across so many critical parts of running a successful business. It is a book that you will read and make you think. It is a book that will make you agree and disagree in equal measure. But most importantly it is a book that will challenge you to do things dif The Rebel Playbook in one word. ‘Controversial’. And that is why I think it does what it sets out to do, and is such an important book for people wanting to make a change. Glenn and Debra challenge what so many of us think 'good looks like' across so many critical parts of running a successful business. It is a book that you will read and make you think. It is a book that will make you agree and disagree in equal measure. But most importantly it is a book that will challenge you to do things differently and push those around (and above you) to change how things should happen. Like every book, I found I had favourite chapters and chapters I re-read a few times before I understood where I was being taken, but every chapter is written by authors who really believe in what they are saying. 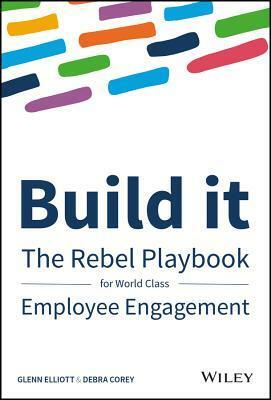 Build It: The Rebel Playbook for World Class Employee Engagement provides a very easy to understand model to boosting engagement to your company. We all know how important it is for a company’s workforce to feel good at their workplace and this guide helps recognize how this with giving valuable examples and hints, as well as case studies. It is, however, a book for Rebels, as per the title. It’s packed with methods that are different from the status quo and some might find it difficult to follo Build It: The Rebel Playbook for World Class Employee Engagement provides a very easy to understand model to boosting engagement to your company. It is, however, a book for Rebels, as per the title. It’s packed with methods that are different from the status quo and some might find it difficult to follow a few of the advices listed there. But being controversial is always good as it pushes the boundaries and makes everyone actually think. This book will inevitably become a 'must read' HR book in 2018. Laid out like a text book, Built It breaks down every element of employee engagement into succinct pieces. From the very basics to the bits most people miss, this book challenges and questions much about the way we work today and shows us how progressive organisations are paving the way. "Maybe we've forgotten what we learned as children?" really sums the book up for me. Somewhere along the way, many organisations have forgotten abou This book will inevitably become a 'must read' HR book in 2018. Laid out like a text book, Built It breaks down every element of employee engagement into succinct pieces. From the very basics to the bits most people miss, this book challenges and questions much about the way we work today and shows us how progressive organisations are paving the way. "Maybe we've forgotten what we learned as children?" really sums the book up for me. Somewhere along the way, many organisations have forgotten about how they should treat their employees and this book is about putting that right. I really enjoyed reading Build It: The Rebel Playbook for World Class Employee Engagement. My favourite two genres are Biographies and Business and this book has them both! There are so many areas of this book that will resonate with everyone who works in 2018. I am not a senior manager or in the HR Team but I still took so much from the plays and advice Debra and Glenn have provided. This book will not only help Managers to work more collaboratively with their employees but I'd also recommend e I really enjoyed reading Build It: The Rebel Playbook for World Class Employee Engagement. My favourite two genres are Biographies and Business and this book has them both! In Build it, there's not only heaps of good advice from the authors, there's also a stack of top tips and plays from some of the best known companies around the world like Netflix, Virgin, KFC and Krispy Kreme. Each chapter tackles a different subject such as leadership, pay and benefits, job design and culture and provides practical advice on how to implement the plays in your business. I've definitely learnt some new things that we'll be implementing at DreamingFish! I really liked this book. I’ve read a couple books on employee engagement and this one is much more conversational and lays things out in an easy to read manner. It wasn’t filled with too many facts and figures nor lots of silly platitudes like “Throw more parties! !” like some other books were. The only thing I disliked was that it was very textbook like with glossy paper and SO many photos and graphs. I suppose that is to appeal to the non I received a copy of this book in a GoodReads giveaway. I was lucky enough to be given a pre-read copy by Debra, and i'm so glad I was! It's full of simple help and reminders of what to do, great cases studies and useful information. Plus it's easy to read as it's written simply and in everyday language. I'm already using some of the things it taught me in a new role, and it helped me go back to basics to do so. I'd totally recommend you read it, and unleash the rebel inside! This book will certainly evoke the rebel in anybody who is passionate about employee engagement. It is inciteful, practical and will take you outside your comfort zone. The book and the way it is set out will take you on a journey packed with exciting and sometimes breaking the rules examples that will inspire you if you are passionate about this topic. Read it and judge for yourself! I've finished reading the BRILLIANT Build it, The Rebel Playbook! It is now without doubt my new go-to handbook as a Reward professional! One of the reasons this book is so great, is because of the simplicity of it. Even if you have little or no budget there are ideas in here which can make massive impact. The book encourages HR professionals to step out of the dark ages and stop doing things in a certain way 'because we have always done it like that' and take risks, which ultimately can lead to I've finished reading the BRILLIANT Build it, The Rebel Playbook! It is now without doubt my new go-to handbook as a Reward professional! One of the reasons this book is so great, is because of the simplicity of it. Even if you have little or no budget there are ideas in here which can make massive impact. The book encourages HR professionals to step out of the dark ages and stop doing things in a certain way 'because we have always done it like that' and take risks, which ultimately can lead to something pretty special! If you work in HR! You need this book! Build It: The Rebel Playbook for World Class Employee Engagement provides a challenging, interesting and useful guidebook, packed with inspiring ideas and support, for anyone who wants to help their organisation along the employee engagement journey. As the authors say regardless of your company’s size and wherever you’re starting from the most important thing is to get moving and start making changes now and this is the playbook to help you on your journey. The key principle of this book is tha Build It: The Rebel Playbook for World Class Employee Engagement provides a challenging, interesting and useful guidebook, packed with inspiring ideas and support, for anyone who wants to help their organisation along the employee engagement journey. As the authors say regardless of your company’s size and wherever you’re starting from the most important thing is to get moving and start making changes now and this is the playbook to help you on your journey. The key principle of this book is that engaged employees build better, stronger and more resilient organisations. Engaged employees, the authors state, make better decisions; are more productive; and innovate more. While company performance data supports this view, studies have also shown that while business leaders recognise the importance of employee engagement, those same leaders are also aware that only a minority of their people can be considered highly engaged. This book seeks to address this engagement gap by providing a framework, the Engagement Bridge, for understanding employee engagement. The ten elements in the bridge, including subjects such as Leadership; Recognition; and Purpose, Mission and Values are explained in separate chapters and then backed up by real life examples from a wide variety of different organisations. These plays, as the authors term them, are one of the key elements of the book. For example, in the chapter on Open and Honest Communication (one of the Engagement Bridge elements), the initial focus is on the importance of honest communication (‘no one trusts you when you lie’) and the need to over communicate (‘use every channel you can: repeat, repeat, repeat’). The authors then explain key rebel outcomes and key rebel behaviours (‘default to honesty’) before looking at communication challenges within a diverse group of organisations including Buffer, Wistia, Better Cloud, GM Holden, Krispy Kreme Australia, and HSBC. Each case study is followed with practical tips on how communication change can be initiated and achieved. While not every example will be directly relevant for each organisation there is a sufficiently broad and diverse range of situations, organisations and industries covered to ensure that the book is useful and relevant to a wide audience. This book is crammed with hints and tips to get the most out of your business and staff. Well worth a browse to get the most out your employees. The business plan looks promising. If you are an adventurous traveller who wants to visit the most beautiful places along their journey of building 'an engaging culture (...) where hard-working people thrive in jobs with challenge and excitement' and 'regularly put their companies and their customers ahead of their own needs', then this book is the map. Your map, which can take you there, no matter which road you decide to take. The engagement bridge, a structured model is discussed in depth and there are many practical examples throughout the book. Honesty, leadership, recognition, learning, pay and benefits and well being are all integral to this process and are discussed in depth with real case studies from companies. If you are looking to g Build It, the Rebel Playbook for World Class Employee Engagement, is an easy to read clear guide to looking at and enhancing engagement in your company or the company you work for. If you are looking to get the best out of your company, engagement with your staff is a priority and this book is for you. Absolutely amazing read. Whether you think you're a rebel, or whether you're teetering on the edge of doing something maverick, this is the book for you. I love the very simple and consumable style, and I'm a massive fan of the mixture of theory, real company examples, and practical tips. As you read it, make sure you've got a note book to capture your ideas, actions and thoughts. This is not a book for the faint hearted who love status quo. This is a challenge and a gauntlet for anyone who has t Absolutely amazing read. Whether you think you're a rebel, or whether you're teetering on the edge of doing something maverick, this is the book for you. I love the very simple and consumable style, and I'm a massive fan of the mixture of theory, real company examples, and practical tips. As you read it, make sure you've got a note book to capture your ideas, actions and thoughts. This is not a book for the faint hearted who love status quo. This is a challenge and a gauntlet for anyone who has the passion and desire to drive change in their teams and organisations. Build It is a treasure trove of practical advice and tips for managers, entrepreneurs, leaders and HR professional, in fact, anyone who is responsible for building and nurturing organisations and people. Combining case studies, the authors' applied experience and applicable frameworks, Build It provides grounded advice on how to motivate your teams and to build genuinely engaged organisations. The book is just as appropriate for FTSE100 companies as for newly launched startups. Engaged staff mean Build It is a treasure trove of practical advice and tips for managers, entrepreneurs, leaders and HR professional, in fact, anyone who is responsible for building and nurturing organisations and people. Combining case studies, the authors' applied experience and applicable frameworks, Build It provides grounded advice on how to motivate your teams and to build genuinely engaged organisations. The book is just as appropriate for FTSE100 companies as for newly launched startups. Engaged staff means excellent products, happy customers and outperformance, and far too often we accept that engagement may be too aspirational for our organisations. A must read and especially relevant in the current hyper-competitive world of human capital. This is a really easy and entertaining read which is also practical and thought provoking! You can read from start to end or pick out topics and read in any order you want, it all joins up and yet each chapter can stand alone. I keep picking it up for short periods and find little gems in every section! The plays are fascinating and I am now going to order more books and encourage our Exec team to read as well! I am already planning to re-read this book, as I was very surprised with style and practicality of it. It gives a lot of options and strategies that are highly usable as well as being entertaining! NB: the stickers were the most adorable thing ever, really cheered me up! Build It: The Rebel Playbook for World Class Employee Engagement is an insightful guide on the steps to Employee Engagement. It offers the right balance between theory and advice, and real-life examples. Written for HR professionals, the book is, in fact, a great read for anyone, in any job role. Having worked for Reward Gateway for nearly 4 years and for the last two being really close to the Engagement Bridge and its development, I picked up the book thinking it’ll be very familiar. In some wa Build It: The Rebel Playbook for World Class Employee Engagement is an insightful guide on the steps to Employee Engagement. It offers the right balance between theory and advice, and real-life examples. Written for HR professionals, the book is, in fact, a great read for anyone, in any job role. Having worked for Reward Gateway for nearly 4 years and for the last two being really close to the Engagement Bridge and its development, I picked up the book thinking it’ll be very familiar. In some ways that was true, but it also felt very new, very fresh, and ideas have matured and taken shape. I’ve heard the explanation of the Bridge many times, but seeing it in writing and in context is very impactful. It makes you believe in the effectiveness of the model even more, learning from Rebels and their wealth of experience. I simply loved reading the book. Glenn and Debra have created a piece that truly inspires the reader to action. What really stood out to me were the many examples of how one can do so much with so little. I loved the chapter about Job Design, as it made me realize how much of employee engagement really depends on it. I’ve learned that having a job that’s designed well means you have the autonomy to do your best work, and many opportunities to develop your skills and receive recognition. I’ve also read the chapters on Leadership and Management a few times now (and included key learnings in our newest Leadership training program). They redefine Leadership and Management, describing leaders as “owning their mistakes, having the courage to be naked and visible, and adding value to their teams” and managers as key drivers of desired behaviors who have real power to “make or break the culture that leadership wants”. I highly recommend that you pick up the book and read it. Trigger warning: This book provokes all sorts of thoughts. It will challenge what you think you know about engaging employees, and it will inspire you with all sorts of possibilities. The book opens with the following: "To the rebels, the misifts, the troublemakers. Let's make the world a better place to work." That was enough to get me hooked because I am a rebel who believes rules are for losers. Deep down inside, you are too, even if you don't realize it just yet! I say this because we all go Trigger warning: This book provokes all sorts of thoughts. It will challenge what you think you know about engaging employees, and it will inspire you with all sorts of possibilities. The book opens with the following: "To the rebels, the misifts, the troublemakers. Let's make the world a better place to work." That was enough to get me hooked because I am a rebel who believes rules are for losers. Deep down inside, you are too, even if you don't realize it just yet! I say this because we all go to work every day. We wall want to make work a positive experience. And we all probably have ideas about how to make that happen (and if you don't, you certainly will after reading this book). And, of course, we all often get frustrated when we feel that the status quo squashes our dreams. But it doesn't have to be that way. Yes, of course this book is inspirational — but it's not just that. It goes well beyond offering feel-good, Tony Robbins B.S. platitudes. I love that it highlights real people, real stories, real impact at all sorts of companies. For example, the book talks about how KFC created career development initiatives for its team members, many of whom are high schoolers. Seriously, how cool is that? There are plenty more examples that will spark all kinds of thinking, organized in a way that makes logical sense — that is, the book presents key elements of employee engagement and then illustrates them with anecdotes. Ultimately, that's really makes this book stand out. While there are similar books out there, they often fall short by delving too much into theory and not enough into practice. I loved that this brought concepts to life in accessible ways where you come away thinking, "Oh, yeah, totally, that might work at my company, too!" Well done Glenn and Debra. This book is fresh and very different. It works because of the rich collection of case studies presented. The underlying principle is “The Engagement Bridge” a set of 10 building blocks e.g. Honest Communication; Purpose, Mission and Values; Leadership; Job Design; Recognition; Pay and Benefits all of which can create enhanced employee motivation and hence productivity. The book is not conceptual but highly pragmatic. The clever piece is that the chapter structure sets Well done Glenn and Debra. This book is fresh and very different. It works because of the rich collection of case studies presented. The underlying principle is “The Engagement Bridge” a set of 10 building blocks e.g. Honest Communication; Purpose, Mission and Values; Leadership; Job Design; Recognition; Pay and Benefits all of which can create enhanced employee motivation and hence productivity. The book is not conceptual but highly pragmatic. The clever piece is that the chapter structure sets out key objectives and commentary and then uses five to seven case studies to describe an organisation’s business dilemma; what the CEO or CHRO decided to do (the “plays”) and the outcomes in hard business results. The main messages are then summarised at the end of each chapter as key take-aways. Whilst many of the reference studies are relatively new start-ups there are also major global organisations cited including Gap, HSBC, GM Holden, Netflix, LinkedIn, Adobe, BCG and GE. The rebel element is that many of these plays challenge conventional HR trends especially in respect of policies, processes and procedures by looking for solutions focused on the employees and the impact on their commitment. Productivity and competitive advantage. As Elliot and Corey stress the book encourages readers to assess which of the building blocks are pressing issues for you so you can build the bridge bit by bit and the more you do the more obvious is the need for greater alignment and intertwining. The sections on Leadership, Learning, Job Design, Workspace and Well-Being are very insightful. The real golden nuggets are that the authors have signposted each case study with further reference materials and social media content allowing you dig deeper. Thank you for these resources. The book has huge passion which is why it is so compelling for start-ups and mature organisations facing disruptors in their marketplace. It is clear what the leaders set out to do is truly in their hearts; so my challenge is can such initiatives continue to sustain this energy if these people move on or new investors take over an organisation? Overall this is an outstanding book and very easy to read. Most of us have a rebel inside us and this is a wonderful stimulus to impact the world of work with creative and inspiring cultures and most of all fun and socially engaging. Well, this is excellent! I have very often 'taken on' employee engagement in an informal capacity in my work but am now in my first formal role of this kind and this book has been invaluable to me. Written in clear, conversational language and with no HR or Communications jargon to be seen this is a really clear walkthrough of the case for an engaged workforce and how you can throw out all (well, most!) conventional thinking on the subject and start having real impact. It breaks the employee exp Well, this is excellent! I have very often 'taken on' employee engagement in an informal capacity in my work but am now in my first formal role of this kind and this book has been invaluable to me. Written in clear, conversational language and with no HR or Communications jargon to be seen this is a really clear walkthrough of the case for an engaged workforce and how you can throw out all (well, most!) conventional thinking on the subject and start having real impact. It breaks the employee experience into clear sections (parts of the Engagement Bridge) but doesn't lost sight of how all the elements working together is where the magic happens, for you, your staff and your business. The plays are from large and smaller organisations from all disciplines and from all over the world and just when you find yourself thinking "Well, that's great for them, they're Amazon!" you get tips on how smaller organisations can take the same thinking and make it work in their own environments. A software engineer by training, MBA drop out turned serial entrepreneur. After a series of failed businesses, I founded Reward Gateway back in 2006 with a radical new approach to employee perks and benefits. With a brand new model, everyone said we'd be bust within a year. But companies and people loved what we did. Building RG into a nearly $500m revenue business I've learned a huge amount about l A software engineer by training, MBA drop out turned serial entrepreneur. Building RG into a nearly $500m revenue business I've learned a huge amount about leadership, company culture and how to create an environment where people can do their best work. I've spent the last 10 years working with some of the most amazing companies on their people strategy and I've learned that to succeed in engaging your people you really need to rebel against the status quo and treat people differently.